Since some years, we are witnessing the rebirth of traditional Heavy Metal throughout the world, both in modern and old ways. And in both ways, you can find excellent (and not so good) new names arising. Obviously, some skepticism is needed to deal with bands with an Old School outfit, of course, but some has such catchy melodies that you can think “blazes, this album is good”, and throw things around. 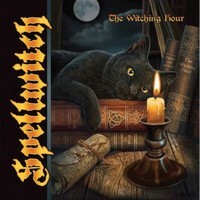 “The Witching Hour”, the first album of Finnish SPELLWITCH is one of these. To be true, it’s a one-man band, with all the musical ideas coming from one person: Kimmo Perämäki, who plays in many bands (the bassist Ossi Raiski is an invited musician). Here, the focus is traditional Heavy Metal, mixing influences from German School, NWOBHM, and even from some minor Schools from the 80’s (like those from Belgium, Netherlands, and even from Sweden and Finland in those days), so be prepared for a very good and tasteful form of music that bears excellent melodies and some aggressiveness, along with catchy choruses. Although you won’t find something unprecedented in musical terms, it’s excellent! Kimmo took the responsibility to produce, mix and master the album. And here is a secret: the sound quality was done to fit in a clear modern way. Yes, it’s heavy, but clean in a way that you can understand what is being played with no problems, and it allows our ears to easily understand the catchy melodies of the songs. We can hear that “The Witching Hour” bears nine excellent witchcrafts, but the best moments are the fine melodies and guitars of “Wreath of Fire”, the thunderous and catchy harmonies on “Across the Universe” (a solid and heavy work from bass guitar and drums can be heard here), the charming and bold atmosphere of “Trust in Fire”, the excellent chorus and vocals of “Magic Scrolls” and “Night Sky (Take Me Under)” (excellent backing vocals and guitar solos), and… Sorry, but this album has no best moments, no best songs, it’s amazing from the beginning to its very end. It’s to hear and to get caught by SPELLWITCH’s spell! “The Witching Hour” is really a lovely album, and it was born to make you join the band’s coven.